Experienced in designing and leading educational courses working with leading cultural institutions such as the Victoria & Albert Museum, Barbican and Flatpack Film Festival. Over the past few years I have delivered hands-on sessions catered to adults, families and children inspired by architectural design and history. When working with organisations I ensure that learning outcomes for sessions are identified from an early point. This enables me to effectively devise sessions which are both educational and engaging. Programmed by the V&A as part of their community outreach work this drop in workshop was devised to engage with children and families from the local area. The workshop was part of a wider project which saw the V&A establish a small pop-up museum within the Lansbury Estate in Poplar, East London. The project looked at the history of the estate, its architectural importance and its perception within the local community. I drew upon these themes and designed a model template based on the iconic clock tower located at the centre of the estate. Participants were invited to assemble their own clock towers. By constructing these 3D forms students were able to develop their skills and knowledge of geometry in a fun and practical way. Sebastian was a fantastic fit for our project and extremely professional to work with. His illustration work was of excellent quality and it was a pleasure to see him assist people of all ages transform his design into their own 3D models. This one-day course was run with the V&A’s Learning Department who offer a year long programme of informative and challenging courses aimed at adults with a range of abilities. Students were taught how to create unique card designs inspired by Architectural fragments from the Museum collections. Using digital image editing software students were taught how to develop their drawings into textured colourful artworks. These designs were then uploaded to an online print service so students could receive a pack of their own greetings cards. By gaining an insight into how to use programmes such as Photoshop students could develop their digital skills while creating an attractive design product. Many of the students had little to no experience of creating digital artworks yet by the end of the day every student had succeeded in the production of a colourful digital design. This workshop was programmed as part of an event celebrating the history of cinema in Birmingham. I was tasked with designing a family workshop inspired by one of the cities famous Art Deco Buildings, the 1930s Odeon in Kingstanding. Inspired by the structure I created an easy to assemble model of the building recreated in bold colours. Families at the workshop were able to create their own paper cinema whilst learning something about the celluloid history of their city. As part of London Design Week 2014 I was commissioned to deliver a workshop with the V&A as part of their programme for London Design Week. 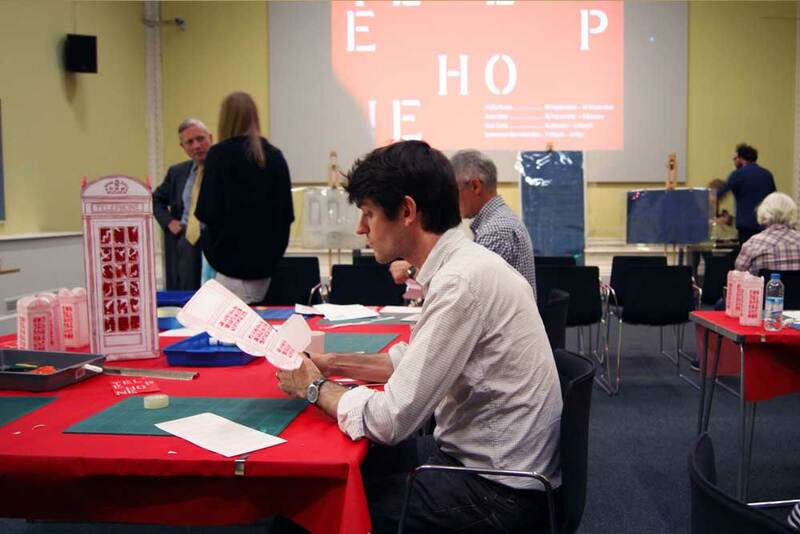 The workshop formed part of a day of lectures and performances inspired by the ninety year anniversary of the original design for Giles Gilbert Scott's Telephone Box. The event functioned both as a celebration of an iconic emblem of 20th century street furniture, and the genius who created it.